Jerome knew that the ordinary people, who were not experts in Greek or Hebrew, would need a version of scriptures that was accessible to all. He was born in AD342 and went to the East, probably what is now Istanbul, where he became a priest. He returned to Rome, acted as secretary to Pope Saint Damasus before settling in Bethlehem in the Holy Land, where he did most of his work of translation. “All teaching is inspired by God and can be usefully used for teaching,” says the reading from Timothy. These words are something St Jerome, priest and doctor of the Church, would certainly have agreed with. Most of us know about St Vincent de Paul through the good work that the Society of St Vincent de Paul does in our parishes. Certainly every parish in Ireland now has a ‘chapter’ of the society and they have their collection every Sunday after Mass. Born in France around 1580 and ordained in 1600 he was taken as a slave by North African pirates in 1605 and was held for two years before he escaped. He also found the Vincentian order of priest and the Daughters of Charity order of nuns. The gospel that the church has chosen for today is from Matthew 9. Jesus looks at the crowd and sees that they are lost and like sheep without a shepherd. Look at our world today: ISIS, Syria, Afghanistan and so many places in Africa at war, and we have no one to lead us. We feel lost. There is always need of a shepherd and that is why the visits of the pope to places where we would almost think he has no business is important. The symbolism of a man of God entering a country cannot be overstated. "Whom do you say that I am?" There is a connection between the first and second readings today that applies to each and every one of us. We all know it: a time to be born, a time to die, a time to fight, a time for peace etc. There is a long list of things that we all understand and experience; they are part of our everyday life. Life is not one big long series of events that brings us somewhere, we are not quite sure where; life is a series of decisions for or against God. Every time we do what is right we choose God, every time we do what is wrong we go against him. It is worth bearing in mind that the choices we make are not isolated but set up a pattern of living; we develop a habit. Jesus tells us to take up the habit of seeing and acknowledging him as Lord and Saviour. Now that’s a choice worth making! Poor old Herod finds himself baffled by who Jesus is. Having beheaded John the Baptist he thought all his problems were over; he had gotten the thing out of his life that he thought was causing the problem, now this Jesus was coming along and disturbing his peace and quiet again. We all do the same thing: I would be happy if only I had a better wife or job, I would be happy if that God person in my conscience didn’t keep hounding me. With people, we are always trying to fix things to suit us, not change ourselves to accept God’s law. Changing ourselves to suit God implies effort and giving up what we think is going to make us happy. Herod had John killed because John preached against his relationship with his brother’s wife. But God does not go away because someone is killed. In his conscience, Herod was still ill at ease, his sin was catching up on him. We do the same thing so much in our own lives; we think getting rid of a friend who tells us the truth will ease our conscience and then find out that it does not work like that. God is very persistent, never leaving us alone til we face the real question, and the real question for us is, are we serious about obeying God’s law or do we want Christianity on our own terms? These questions are so imbedded in us that we find them hard to answer truthfully. That’s why Herod’s story resonates with each of us; our conscience is always pricking us, even when we think we have got rid of the problem. It sounds harsh but in fairness to Luke, who is recording the story, and to Jesus, what they are doing is using something like what we call ‘dramatic irony’ when an exaggerated story is told to make a point. What Jesus was saying was that this new life of the gospel and this new kingdom of heaven which he was preaching are the most important things in the world and a person will not grasp the real significance of his words if they do not make them the most important thing in their lives. So many of us play at being Christians: we are half in and half out. Jesus is saying that this attitude gets us nowhere. We are like those people who want to be great footballers but who don’t want to train. Padre Pio, as we all still call him, is a modern saint of our times. There is so much known about him, his writings, his miracles and his holiness. He is one of those great men who had an immense impact on those he met. As you would expect, nowadays there are several websites devoted to the saint and they are well worth a read. We all have our favourite stories about saints. In the case of St Pio what I always think of is the fact that so many people who attended his Mass would not see the time going in. He always took a couple of hours to say Mass and yet invariably the people would come out thinking that they were in there for just a few minutes. “From age to age you shall gather a people to yourself,” is a line form the 3rd Eucharistic prayer. In Padre Pio we see an example of a person in whom you worked in such a way that not even the world with all its hatred of God, could deny his goodness and love. Pope John Paul II and Mother Theresa were also examples of this kind as is Pope Francis. One of the things that helps me the most is that I know that as I sit and read this somewhere in the world God is now preparing another such person. God, as he has shown many times, will raise people of the truth in places and at times that we don’t expect them, he will not be out done. As an old priest friend of mine used to say, “Our God is a great God,” and he will show it to us in many ways. Paul cuts to the very heart of the gospel in today's reading. It seems that some people have been beginning to say that Jesus did not rise from the dead but Paul says that belief in the resurrection is at the very heart of the gospel. He actually goes further and says that if Jesus did not rise then all his preaching and the preaching of the other apostle’s counts for nothing. When Jesus became human he raised up the dignity of all people, he honoured human nature and made it worthy of redemption. When he rose from the dead, he was the first to do so and because he has been raised we also shall rise on the last day. The resurrection of Jesus is the cause of our resurrection and if Jesus did not overcome death then no one shall. What Paul is saying is that the resurrection is the central tenet of the faith: he reasons that if Jesus lived for this life alone then all who die would have no hope. But Jesus came to make this life and the next life in heaven into one big long life that is in effect eternal and never ending. Jesus died and rose and we shall do the same: that is the central tenet of our faith. Just as we have today, Paul had to contend with all sorts of strange teachings. Perhaps it was a bit more reasonable then as people were still led by superstition and had not been taught the Christian faith. But we now believe anything and we have much less excuse because with very little effort we can find orthodox teaching on the net, in books or wherever. Paul is quite firm on this, saying that the gospel will only bear fruit in our lives if we believe exactly what the Church teaches. We have so many semi Christians in the world and in some areas of our lives many of us hold ideas that are not compatible with the church. I have found this advice to be always right; when I think that I know better than the church, if I study and meditate upon it, I invariably turn out to be wrong. In today’s gospel, what we are hearing about is attitudes: the people complain that the disciples of Jesus do not fast and the disciples of John do. Then there is the story of the playing of songs, if we play sad songs you don’t cry, happy ones and you don’t dance. We are back to the old story of you can’t please some people. We see this so much today; no matter what the church does it is wrong and no matter what the proofs are that say what the church teaches, there are people who simply won’t believe. They are belligerent to the teaching of God and no matter what he does they have no intention of believing. The reason for this is that people are still full of pride: I will decided when God has done enough for me to believe in him, I will say when I am satisfied that he has shown me the truth. The hurdle left to overcome is that “I” am still the centre of the universe and that as long as this is the place where I want to be then any idea of God makes no sense to me. When “I” occupy centre stage, what is really happening is that I am worshipping myself and my own ideas. In this case I can never get to know God. 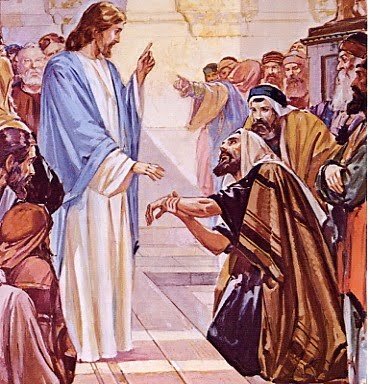 Today, the Lord gives us a lesson in attitudes; the poor old Pharisees are tied down by the Law and Jesus comes along and makes a big hole in all they believe. It is a simple and ordinary situation: Jesus is in the synagogue and a man needs cured. For the Pharisee the Law was more important than the man. For Jesus the Law is there to guide us, not to rule us. That is the essential difference between those who would beat you down with the Law and those who see the Law as a guide to life. We still have such people today and in fact we can often use the Law and the rules to condemn others. When it suits us we can be very harsh in our attitude and we can feel justified and superior pointing out some small rule that the person is guilty of breaking. All the while we miss the big things that we ourselves are doing. 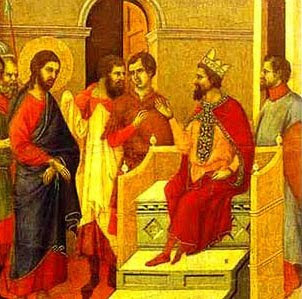 Jesus faced the Pharisees head on: he questioned them in ways that they could not answer and which only showed the hypocrisy of their mind-set. We must always be on our guard for the thinking of the Pharisee in our own lives. It slips in so easy when we are pointing the finger at our neighbour. Lord, forgive me for the many times I do it!